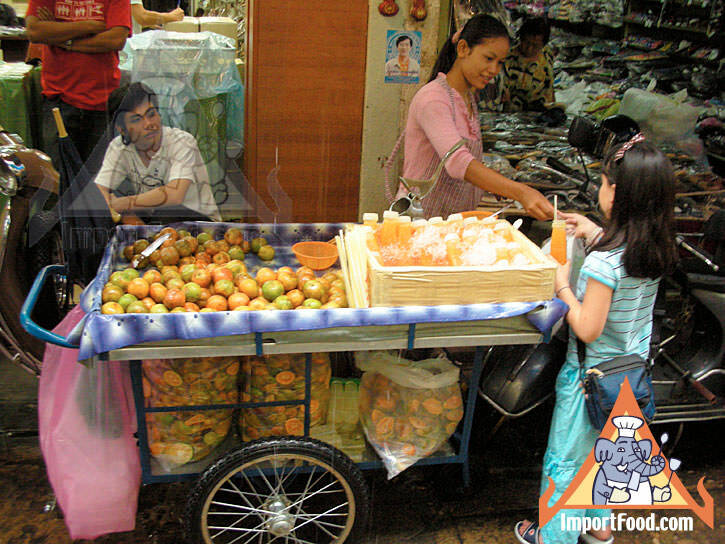 Throughout Thailand you can easily find packaged orange juice on refrigerated shelves in corner stores, but an ever-present competitor is the less expensive and fresher alternative made by enterprising street vendors who slice, squeeze and bottle this juice all day long. Here are photos of an attractive young lady and her cart in the busy Sampeng district of Bangkok, at the wholesale shoe market. For 10 baht (about US$0.30) you can buy a plastic bottle, approximately 10 ounces. Thai juicing oranges are called "som bangmot" and are ideal for making delicious juice. 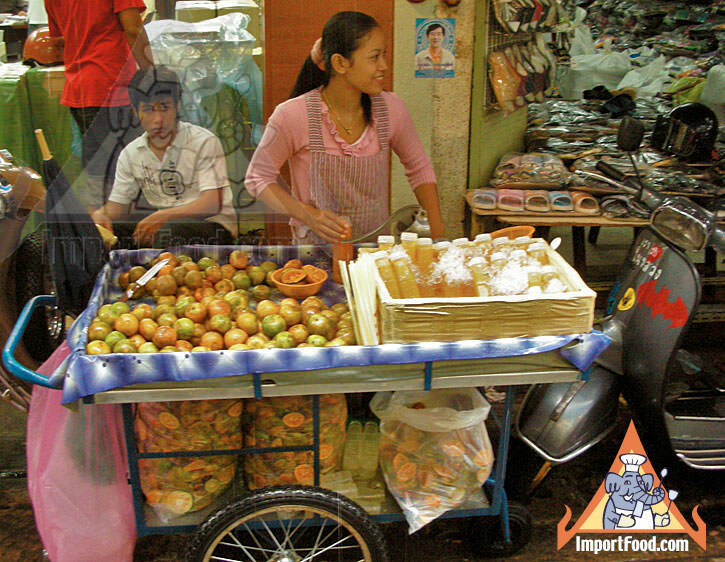 The oranges are available year-round, however during some months if the oranges are a bit sour, vendors often add "nam chew-am" which is a simple sugar syrup, often with a bit of salt, to flavor the juice. 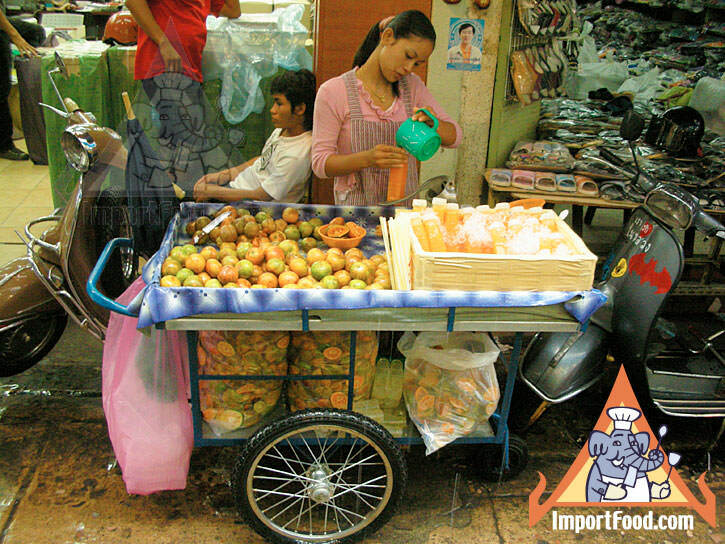 Thai juicing oranges have fragrant, freckled peel, and are rich in folic acid, fiber and Vitamin C.
Notice the sturdy cart is set up just for this purpose, with fresh oranges on top, and the peels stored in plastic bags below. Prepared bottles are kept on ice in the top tray on the right, the little orange basket holds peels, and as with every drink in Thailand for each purchase you get a straw. Her hand-press juicer is visible just in front of where she's standing, note the long silver handle. 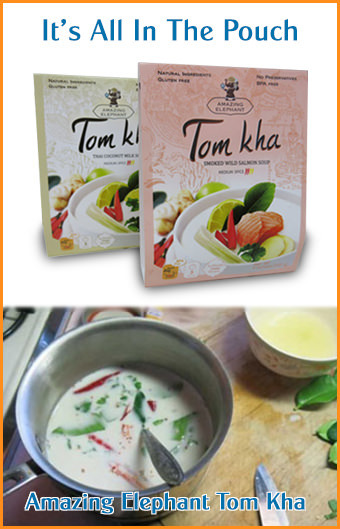 This is the style used throughout Thailand by street vendors, who also make fresh lime juice and bottle it for cooks who need it for dishes like som tum, tom yum or pad Thai.